A great excursion business for sale is this well-established buggy business including an excursion shop. 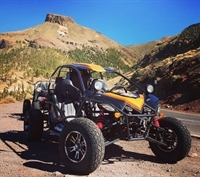 The shop sells both the buggy trips and other excursions in Tenerife. Included in the business sales are 6 buggies, all PR material, social media accounts, a good connection to hotels and excursion shops, and a handover period. The buggies are 1 Ninja from 2016 with an 1100 cc engine, 2 Jeep Booster buggies from 2011 but with new 850 cc engines, and 3 Lantanas from 2010 also with new 850 cc engines. For more than 2,5 year the business has been established and it has all licenses in order. Furthermore, TripAdvisor, Google, and Instagram show happy clients, which also secures the business a healthy income. On top of this, you are guaranteed the best PR since you will have your own excursion shop.